Are you a cupcake lover? And are you looking for a non-traditional cake? 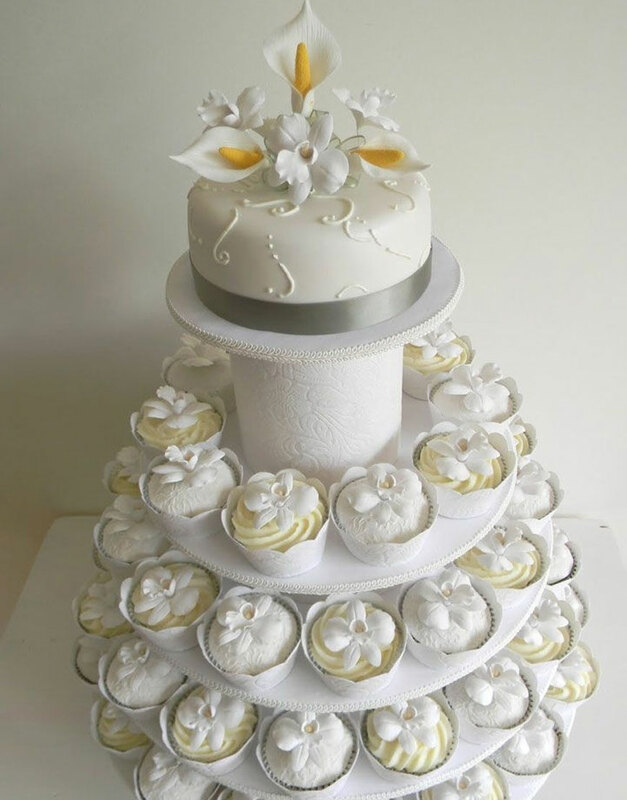 Then this Elegant White Wedding Cupcake Tower is an excellent pick for you. Cupcakes are perfect for weddings. Easy to serve and easy to eat, they are a delight in any form. Cupcakes have a great taste and the best single-serving desserts. Not only they are easy to eat, but they are also easy on your pocket. You can get them in various flavours, colours and even designs. This cake has four tiers of cupcakes. The cupcakes are covered with creamy buttercream icing with delicate fondant flowers, to make for a picture-perfect confection. Are you worried you will not be able to cut the cake, together as man and wife? No worries! There is a layer of regular cake on the top tier. This one is covered with white fondant, topped with fondant flowers and finished off with a pretty ribbon. Our wedding cakes can be customized according to your specifications. We make the picture perfect cakes that create a long-lasting memory. Contact us or order online to kick start your wedding cake project.